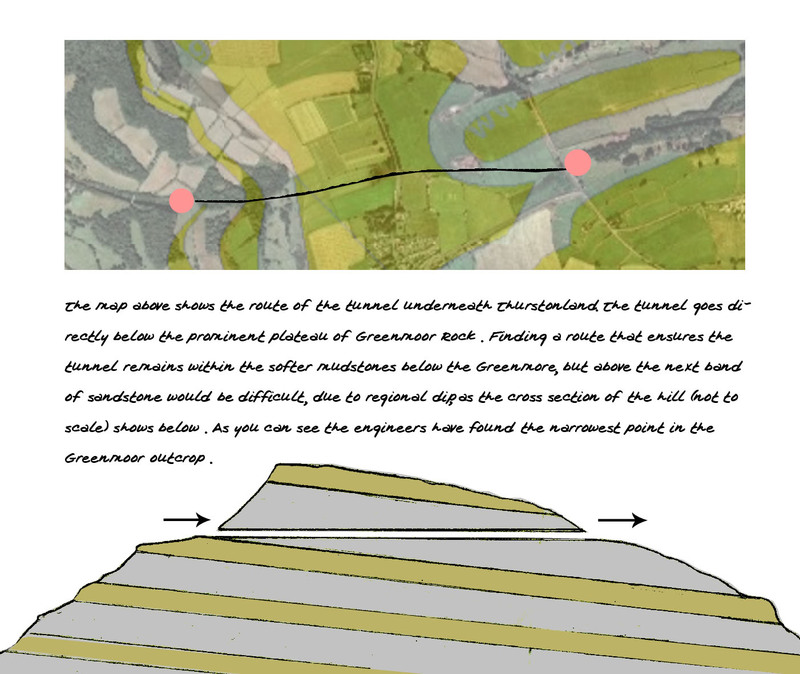 Learn how the landscape was shaped in Thurstonland and Stocskmoor. On this walk, you will see very spectacular views of the iconic Pennine landscape, from which you can interpret a clear understanding of how the underlying geology influences the lay of the land. Unfortunately there is not much exposed bedrock geology to look at, but the astonishing vistas more than make up for this. As you head North from Thurstonland village, you will venture along a marked ridge, with the church to the East and the Holme Valley to the West. There is a notable steep drop to your left that contrasts with the flat land to your right. This is the product of a sudden change inlithology.You are standing on the Greenmore Sandstone, which is mostly made up of the grains of the resilient mineral quartz, which been compressed andcementedover millions of years (don’t forget, these rocks were deposited 310 million years ago). Yet directly below this, you can see that the lithologyis not so resilient, and has succumbed to weathering to produce the ridge. This is because beneath the Greenmoor sandstone is amudstone;this contains quartz, but is composed mainly ofclay mineralsthat react readily with water to decompose. You can see small landslips occurring on the surface of the hillside as a result of this. This differential in weathering potential has sculpted the Pennine landscape, and if you now look into the distance you can see that all of the fells demonstrate this sudden drop from a relatively flat plateau. However, there are two more processes that have been vital in determining the form the landscape takes. Notice how Meltham Moor in the distance doesn’t quite sit horizontally. The layers of rock have not remained flat, as when they were deposited, but have beenupliftedanddeformeddue to stresses from the movement oftectonic plates. This ‘squeezing’ has resulted in an ‘arch’ oranticlinerunning down the middle of Northern England, resulting in the uplifted area we now call The Pennines. Here on thiswingof the anticline, there is therefore aregional dipto the East. Geometry then tells us that we would expect to see the oldest, deepest rocks exposed at the surface towards the core of the Pennines. The last part of the geological story that has determined the shape of the landscape started to occur (and is still ongoing) around 17 thousand years ago. Unlike areas to the North of Halifax, there was no glacier here. The landscape wasperiglacial;similar to Siberia or Iceland, and has been weathered by frost-shattering. This has left boulders on the tops of the moors, with the valleys being eroded by the large rivers of glacial meltwater from the Aire valley. Further along as you come off Green Side Road, you will enter woodland, and begin to descend into a valley. The woodland in this area is very important to both geologists and archaeologists, as this is the site of a medieval iron enterprise. Around this area is a seam of coal known as the Black Bed Coal that can be found throughout West Yorkshire. Above this is a narrow band of sideritic ironstone, which means that iron is found here in the form of anodular carbonate. This iron was explored and won by Monks from Rivaux and Fountains Abbey until the acts of enclosure in the 16thcentury. As you cross the railway you can see a tunnel entrance. This is been carefully located here, below the Greenmoor rock, as it was much easier to excavate material from the underlying mudstone. The train therefore travels beneath the protruding Greenmoor plateau to emerge on the other side of Thurstonland. Further around the circuit you will walk up a very steep hill, again a product of a sandstone ridge. This sandstone ridge is exposed fully in a quarry that can be seen 200 meters to east along this ridge, next to the old brickworks. If you want to explore the geology further, this is a locality worth seeing, which demonstrates an excellent cross section of the Greenmoor Sandstone.